Elegance and function combine to give this TV stand a striking appearance. Plasma/LCD TV Stand features three thick 8 mm. clear tempered glass shelves provide ample storage space for your DVD VCR gaming and/or stereo components. Stand will accommodate a 32 in. flat panel television. And is used as part of the TVM-075 and TVM-082 Extended Plasma Stands. Dimensions - 20 W x 16 D x 30 H in. Elegance and function combine to give this TV stand a striking gloss white appearance. Plasma/LCD TV Stand features three thick 8mm frosted tempered glass shelves provide ample storage space for your DVD VCR gaming and/or stereo components. Stand will accommodate a 32 flat panel television. Easy to assemble. Accessories not included. This stand also is useful as a End table or Utility table. And is used as part of the TVM-075W Plasma Stands. 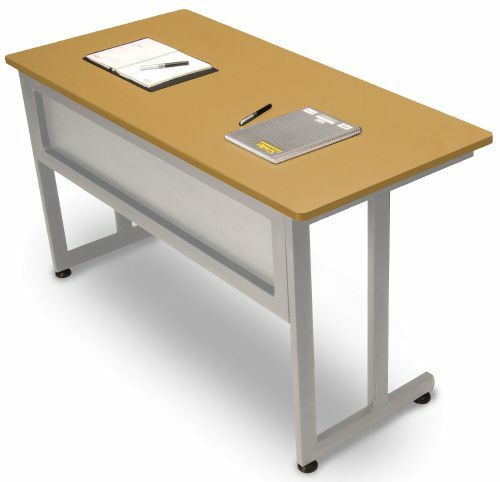 This modular utility table had a sleek style that looks great in any office or group multiple desks together to create a training room environment. The industrial strength scratch-resistant steel frame will still look great after heavy use. Innovative snap & lock technology makes assembly very easy -- with no tools required! Scratch-resistant thermofused melamine surface. Includes adjustable leveling glides. Optional casters available (55CAS). Weight capacity 400 lbs. Designed and built for commercial use. Rectangular utility table features a 1-1/8 thick laminate top with self edge square corners PVC-edge banding 3-1/8 high metal apron and 1-11/16 overhang. Both sides have a thermally-fused melamine surface. Square chrome-plated legs have adjustable leveling glides that screw in. 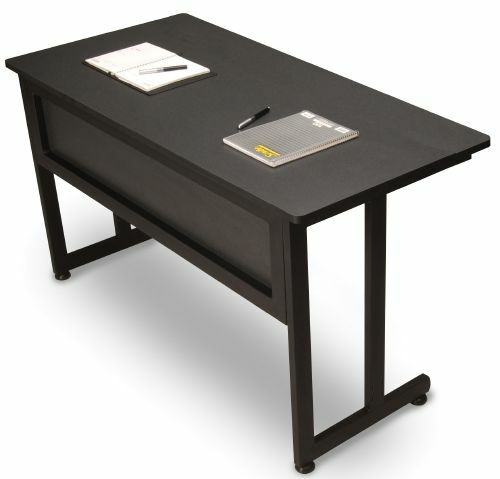 Utility table is made of steel and meets or exceeds applicable ANSI/BIFMA standards. Durable laminate top with painted apron. Chrome legs attach easily with bracket style assembly. Leveling glides help prevent table from rocking. Top Color/Finish: Harvest/Putty/Chrome; Diameter: N/A; Width: 72 in; Depth: 18 in. An easy way to expand your work area. Economically priced table with 3/4 woodgrain laminate top. Stable nonfolding 1 square steel legs with plastic glides. Height 30. Enamel finish on 2-1/4 apron and legs. Top Color: Walnut/Black; Top Shape: Rectangular; Top Thickness: 3/4; Overall Width: 48. An easy way to expand your work area. Economically priced table with 3/4 woodgrain laminate top. Stable nonfolding 1 square steel legs with plastic glides. Height 30. Enamel finish on 2-1/4 apron and legs. Top Color: Walnut/Black; Top Shape: Rectangular; Top Thickness: 3/4; Overall Width: 30. An easy way to expand your work area. Economically priced table with 3/4 woodgrain laminate top. Stable nonfolding 1 square steel legs with plastic glides. Height 30. Enamel finish on 2-1/4 apron and legs. Top Color: Oak/Brown; Top Shape: Rectangular; Top Thickness: 3/4; Overall Width: 30. An easy way to expand your work area. Economically priced table with 3/4 woodgrain laminate top. Stable nonfolding 1 square steel legs with plastic glides. Height 30. Enamel finish on 2-1/4 apron and legs. Top Color: Oak/Brown; Top Shape: Rectangular; Top Thickness: 3/4; Overall Width: 48. An easy way to expand your work area. Economically priced table with 3/4 woodgrain laminate top. Stable nonfolding 1 square steel legs with plastic glides. Height 30. Enamel finish on 2-1/4 apron and legs. Top Color: Walnut/Black; Top Shape: Rectangular; Top Thickness: 3/4; Overall Width: 60. 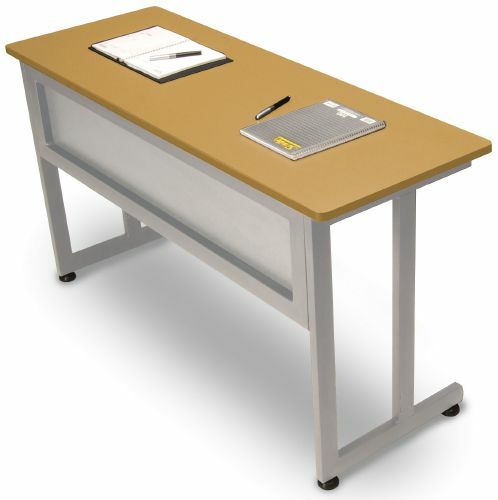 Mobile Utility Table Model 66745 is useful in any office. Features solid steel construction and gray 9 mm. protective edge banding for durability and years of use. The 1.25 in. thick high - pressure laminate top. Includes 1 - position adjustable metal shelf. Casters are included for easy mobility. The 1 .25 in. thick high - pressure laminate top comes in our choice of three Finishes. Gray 9 mm. T - mold protective edge banding. Size - 27.50 X 19.75 in. Dimension - 19.75 x 27.50 x 29.75 in. The popular 55141 training table is now available with a larger tabletop! This modular utility table has a sleek style that looks great in any office and has 20% more usable surface area than the 55141. Group multiple desks together to create a training room environment. The "industrial strength" scratch-resistant steel frame will still look great after heavy use. Scratch-resistant powder-coated paint finish on durable steel base and frame. Dimension - 23.75 D x 55.25 W x 29.5 H in. OFM UT2448-MPL Utility Table Maple 24 x 48 in. 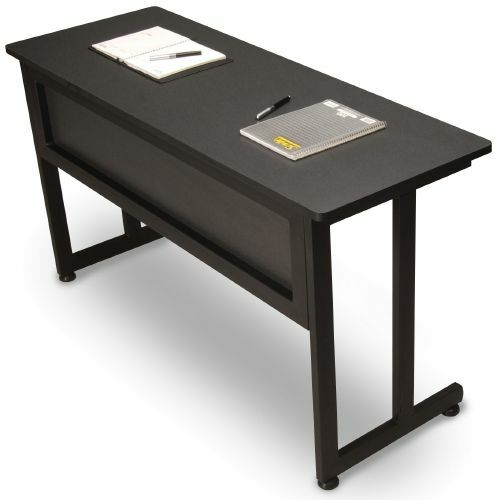 OFM has your go-to utility table whether you need it for a library office school. Model UT2448 is a 48 in. W x 24"D table that's durable enough for industrial settings and attractive enough for the hospitality industry. Laminate top comes in your choice of stylish finishes. The heavy-duty 15-gauge steel frame is protected by a scratch-resistant paint finish. Leveling glides make for easy adjustments and stability. Comes in a variety of sizes so you can create whatever configuration you need. OFM UT2448-OAK Utility Table Oak 24 x 48 in. OFM UT2448-CHY Utility Table Cherry 24 x 48 in. Need a table that stands up under pressure and stays attractive? Utility Tables is a 48 x 30 D in. table that's durable enough for industrial settings and attractive enough for the hospitality industry. The heavy-duty 15-gauge steel frame is protected by a scratch-resistant paint finish. Leveling glides make for easy adjustments and stability. Dimension - 30 x 48 x 30 in.